Out of a 7-day week, I probably eat avocado 4 to 5 days. I buy several at a time, leaving one on the counter to ripen, keeping the others in the fridge until I'm ready to get another one out to let it sit on the counter for a day or two. I put it on salads, in wraps and sometimes just eat them as-is. However, I could use some new ideas. So come forward, avocado lovers, and tell me your favorite ways to eat the beautiful things. 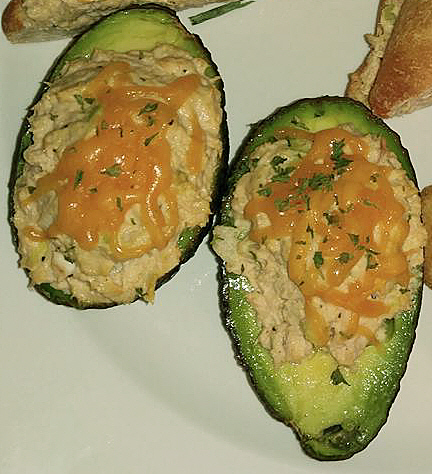 Tuna melt in an avocado. 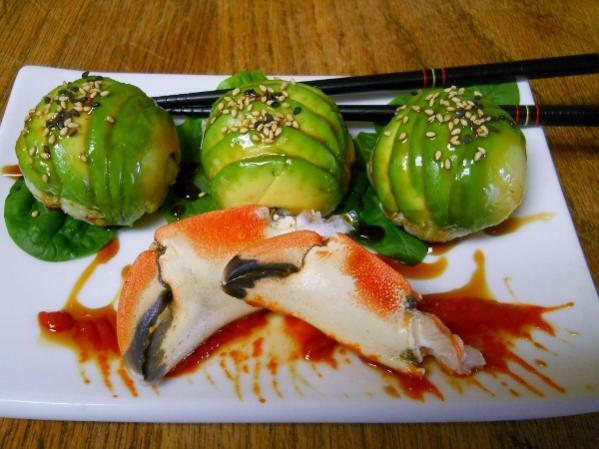 Sushi bon-bon's with crab. You can use shrimp,crab,lobster etc. with Eel sauce. Long ago, I tagged along with Himself when he had a training session in the Anaheim area. As part of his hotel package, we'd enjoy a full breakfast in the hotel restaurant each morning. The first day I ordered their "California Omelet", which included bacon, avocado, and provolone cheese. To. Die. For! I think I had it two more times in the span of a week. Their presentation included two full strips of bacon and half the avocado on half of the omelet, flip the other half of the omelet over that, then provolone and the other half of the avocado, sliced, across the top of the omelet. I prefer scattering crumbled bacon across the eggs once they're in the pan, and slicing all of the avocado both under and over the omelet. And provolone ALL over! Smoked prov is really good, too. Now I need to add avocado and provolone to my next shopping list. Funny you mention the shopping list thing. My son teased me about that the other day. I use those magnetic shopping list note pads and one is always hanging on the fridge. My son was writing something he wants onto the list and chuckled, then said "Gee, why am I not surprised to see avocado on here?" I said "Hey, you don't know what you're missing" because he refuses to eat them. Yes you do. And don't forget! Good thread, Linda - and great looking pics and ideas! 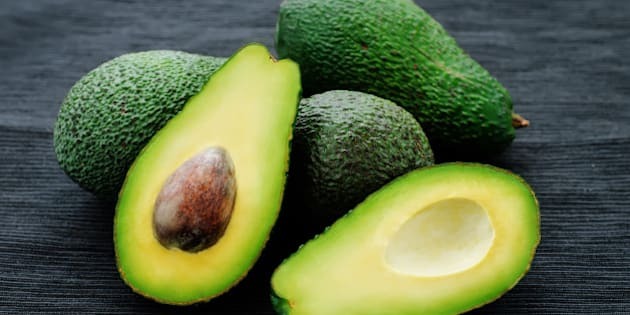 I love avocados too, and other than sliced with a little lemon or lime juice, I think my fave is good ol' chunky guacamole. If there's any leftover, I smoosh some plastic wrap on it to keep it from browning, and spread it over toast the next morning. When we eat them "as is" I sprinkle a little garlic salt on them. A famous restaurant in NM is embarrassed to give out their recipe for guacamole because it is only avocado and garlic salt. Very easy way to use ripe avocados. For some odd reason all this avocado talk reminds me of a scene from the movie "Bottle Shock" where Alan Rickman (Britt wine snob) samples some guacamole for the very first time while visiting the California wine country. I don't put a lot of stuff into my guac, either. A little salt to bring out the flavors, a little garlic powder, a touch of lime juice and sometimes I'll add diced tomatoes. That's it. Why I have not made a BLT in a toasted tortilla is beyond me.. I will remedy that very soon..